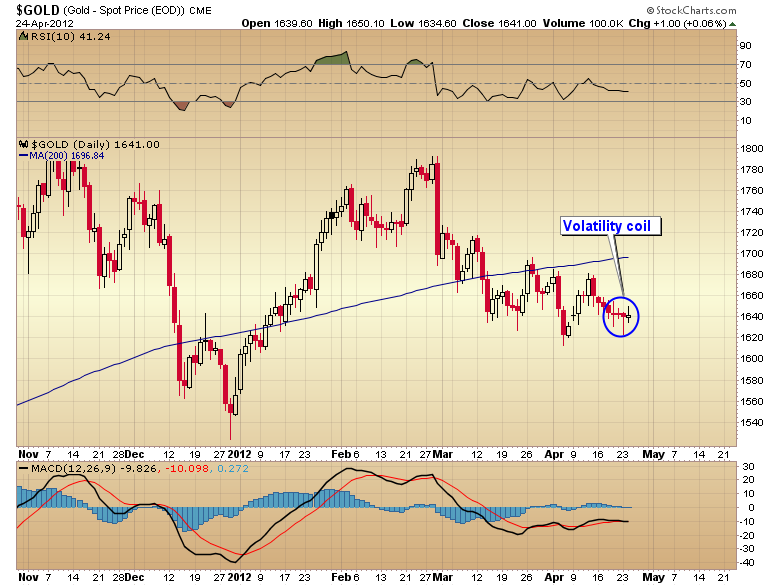 Over the last several days volatility in the gold market has collapsed forming what is known as a coil. 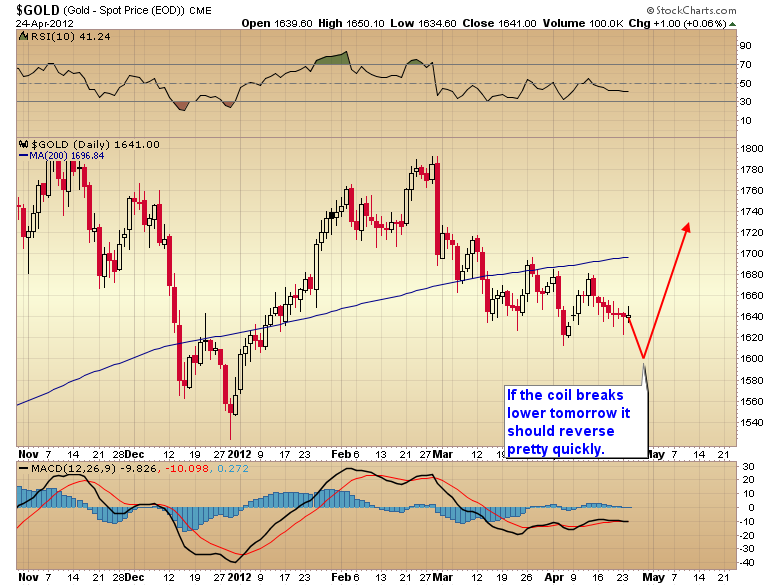 I think the Fed announcement tomorrow will probably break gold out of this holding pattern. But contrary to popular belief about 70% of the time the initial move out of a coil ends up being a false move that is reversed by a more powerful and durable move in the opposite direction. In this case if gold breaks lower out of the coil it is late enough in the intermediate cycle that the move would be unlikely to last more than a few days before forming what would presumably be an intermediate cycle and B-Wave bottom. 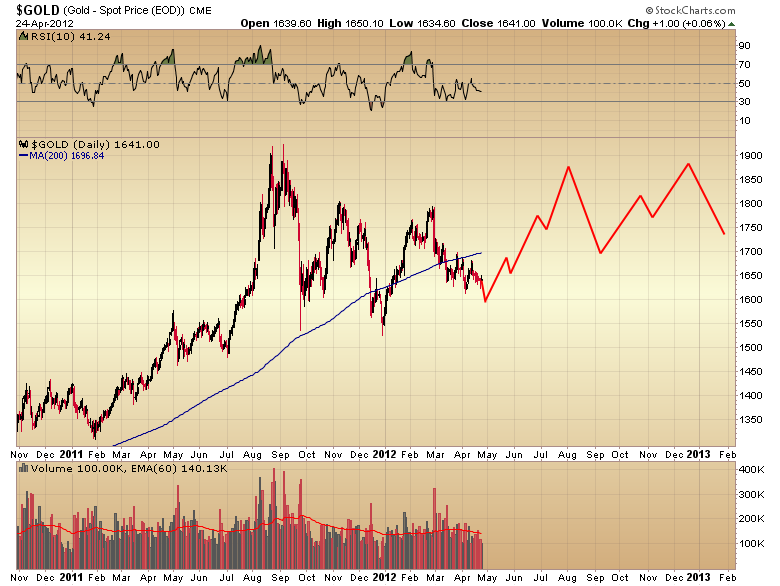 I suspect many gold bugs are going to get knocked out of their position if this scenario plays out tomorrow. However if this does turn out to be a B-Wave bottom like I think it will, the next couple of days are going to be the single best buying opportunity for the rest of this secular bull market. That doesn’t mean that gold will reverse and head straight up immediately. I expect we will probably see a volatile consolidation with several tests of the all-time highs above $1900 but no breakout for the rest of the summer. 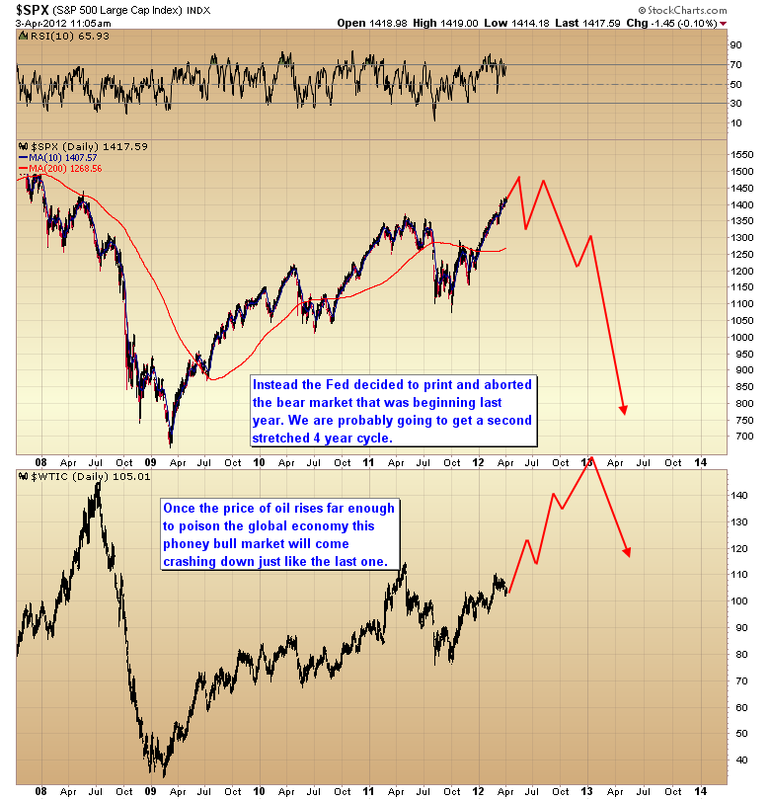 Traders are going to be looking for the next trend once the stock market bottoms. I doubt that tech stocks are going to resume the leading role that they’ve enjoyed since last October. More likely liquidity will find its way into a beaten up sector. Like I always say, liquidity will eventually flow into undervalued assets. There is no sector as undervalued and as unloved as the mining stocks right now. Sentiment in this sector has reached levels of pessimism capable of generating triple digit returns over the next couple of years, and I wouldn’t even be surprised to see a 25 – 50% gain during the next intermediate cycle alone. I think the next momentum move is about to begin in the sector most overlooked and least expected by investors, the mining stocks. This entry was posted in Uncategorized on April 25, 2012 by Gary. This entry was posted in Uncategorized on April 19, 2012 by Gary. This entry was posted in Uncategorized on April 17, 2012 by Gary. This entry was posted in Uncategorized on April 12, 2012 by Gary. 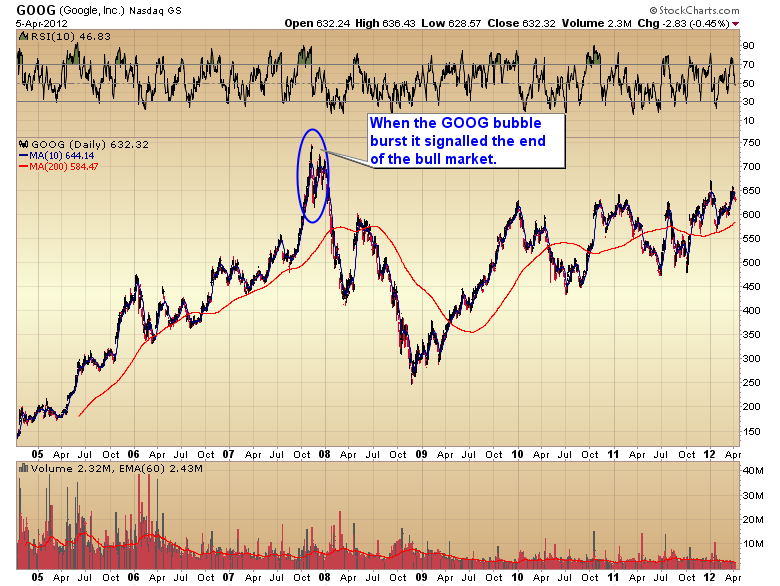 The last bull ended when the leading stock, GOOG, entered a parabolic “bubble” phase. That was the signal that the bull had reached the euphoria stage. When the GOOG bubble popped it signaled the end of the bull market. Two stocks, AAPL and PCLN, have been the leaders of this bull market. Both have entered the euphoric “bubble” stage. 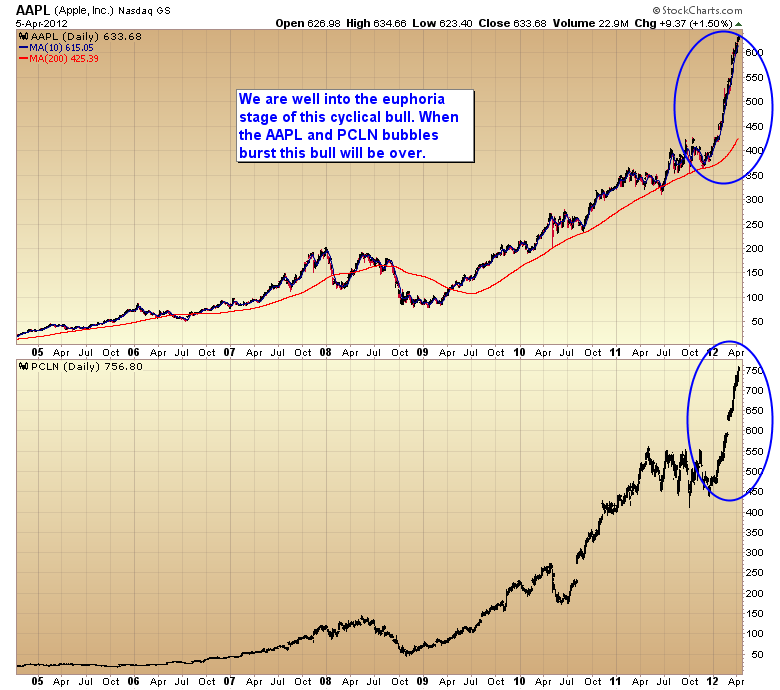 When the Apple and Priceline parabolas break it will almost certainly signal the end of this bull market. Apple is now stretched 49% above the 200 day moving average. Anything between 50 and 60% above the mean is extreme dangerous territory. As I pointed out in my last article the dollar is beginning its second daily cycle up in what could very well be a cyclical bull market. This should correspond with the stock market topping and the next leg down in the secular bear market. 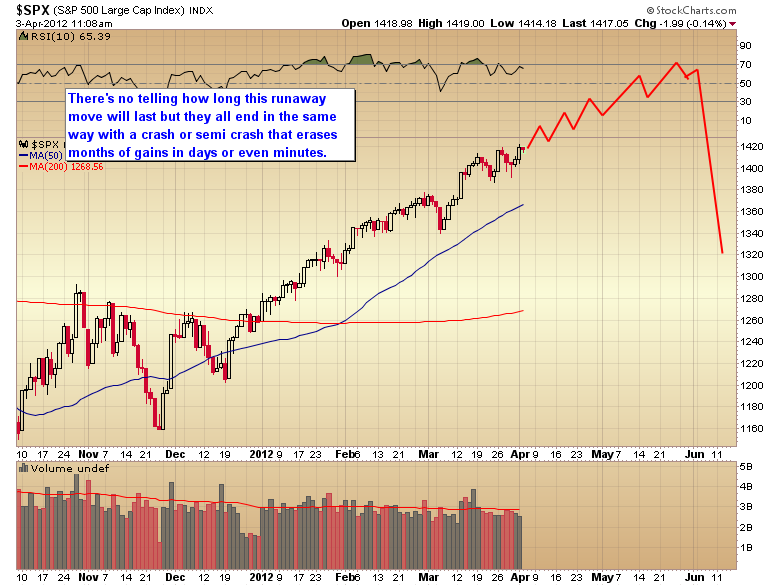 My best guess is that we will see a sharp sell off over the next 2 to 3 weeks, followed by a sharp rebound (QE3?) 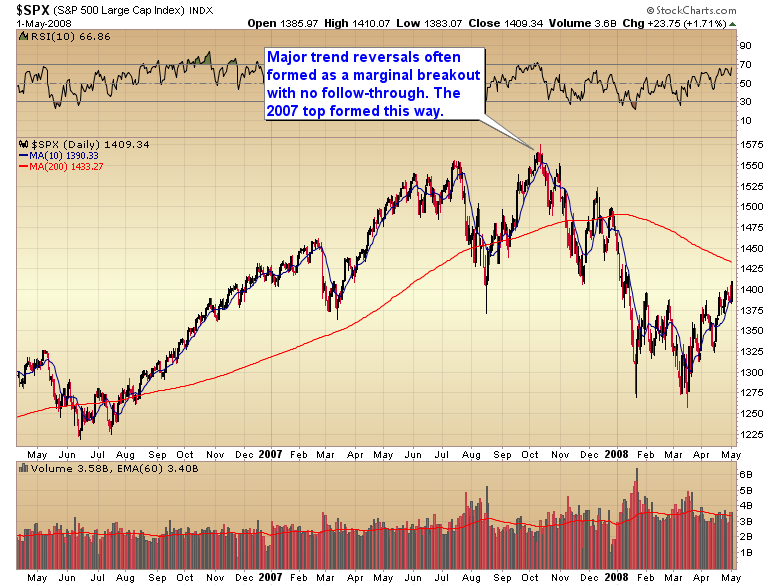 that may, or may not, move stocks to marginal new highs, similar to the 2007 top. The poor employment report on Friday is the first warning shot across the bow that the economy is slowing in preparation for moving down into the next recession/depression. Bernanke is in the same position he was in 2007. Printing more money won’t stop the collapse. 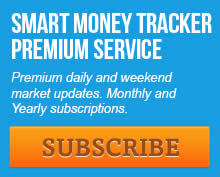 It will only continue to spike the price of energy and exacerbate the decline. This entry was posted in Uncategorized on April 7, 2012 by Gary. As convincing as this rally has been I am confident this is an ending phase and not the start a new secular bull market. Actually the bear market began last year in May but was temporarily aborted by massive central bank printing. Let me explain. The last four year cycle that started in 2002 and bottomed in 2009 was the longest four year cycle in history. It was stretched to these extreme lengths by Bernanke’s desperate strategy of debasing the currency to avoid the bear market that should have begun in 2006. Instead the stock market cycle stretched all the way into the spring of 2009. I have mentioned before that often a long cycle will be followed by a short cycle. 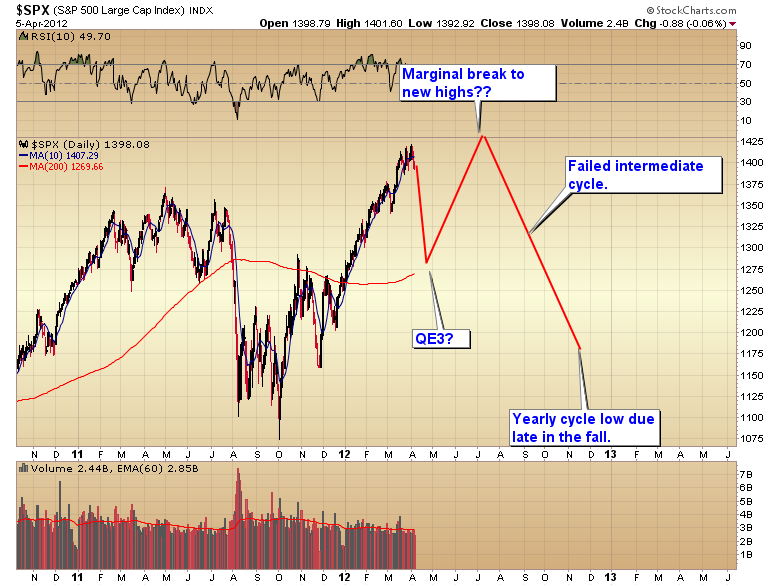 This being the case the current four year cycle should have bottomed in the fall of 2012. That process had begun last summer. However, central banks around the world, in the futile attempt to avoid a global depression again cranked up the printing presses. 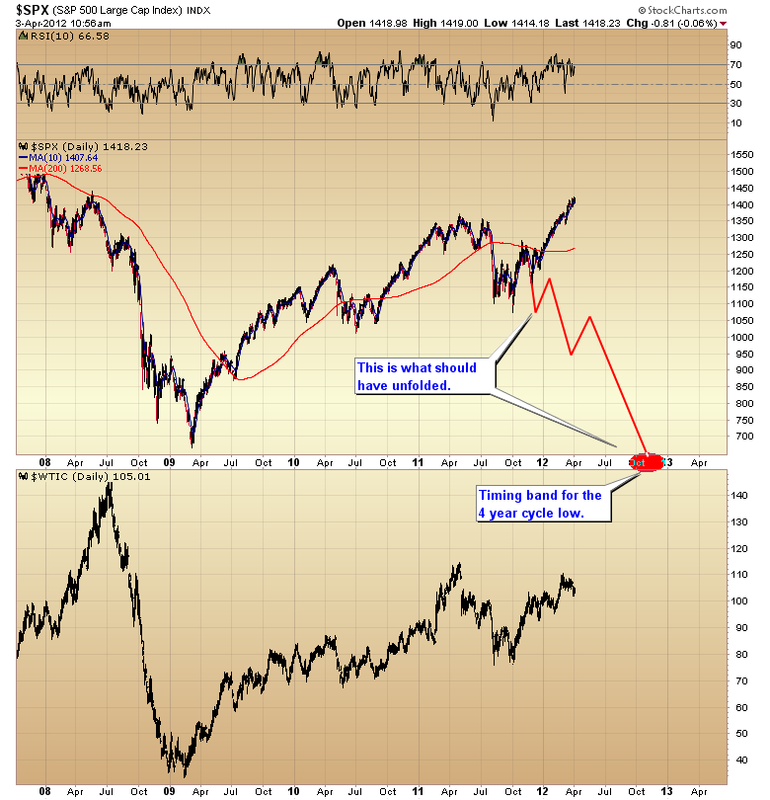 The bear market that had begun in May was temporarily aborted. Amazingly I think we are going to see another stretched four year cycle. And this one is going to end just like the last one when the price of oil spikes far enough to collapse the global economy and another market crash. The next economic downturn won’t be a Great Recession, it will be a Great Depression. At the moment the stock market is in a runaway move very similar to what unfolded out of the summer 2006 yearly cycle low. These runaway moves are characterized by uniform mild corrections all of similar magnitude and duration. For this particular rally the corrective size has been roughly 25-35 points. This could continue for weeks or months, but all runaway moves end in the same fashion, with a crash or semi crash that wipes out months of gains in a matter of days or even minutes. Generally speaking, once a corrective move has run 20% beyond the normal correction size that is the signal that the move is over. Unfortunately, at that point you are usually already into the ‘crash day’. This is why at some point one has to say enough is enough, and stand aside, or you risk getting caught in the crash. When this runaway move comes to an end I’m pretty sure it will signal the beginning of the end for this cyclical bull market. That doesn’t mean that we won’t see a test or even a marginal break to new highs but I think we are clearly in the final phase of this liquidity driven rally that began in March of 2009. We are now at the mercy of oil and the commodity markets. Bernanke’s plan to print our way to prosperity is destined to failure. Ultimately he is just going to spike inflation and collapse the global economy, resulting in a worse downturn than what we saw in 2008/09. Whether that breaking point is at $120 oil or $160 oil is anyone’s guess. This entry was posted in Uncategorized on April 3, 2012 by Gary.